Bodhi is a beautiful tri-color buckling out of one of my favorite Does, 2 time Grand Champion Beaujolais. He is super sweet and mellow, and his coat is amazing! Lots of bangs and body coat, and pretty, colorful markings. 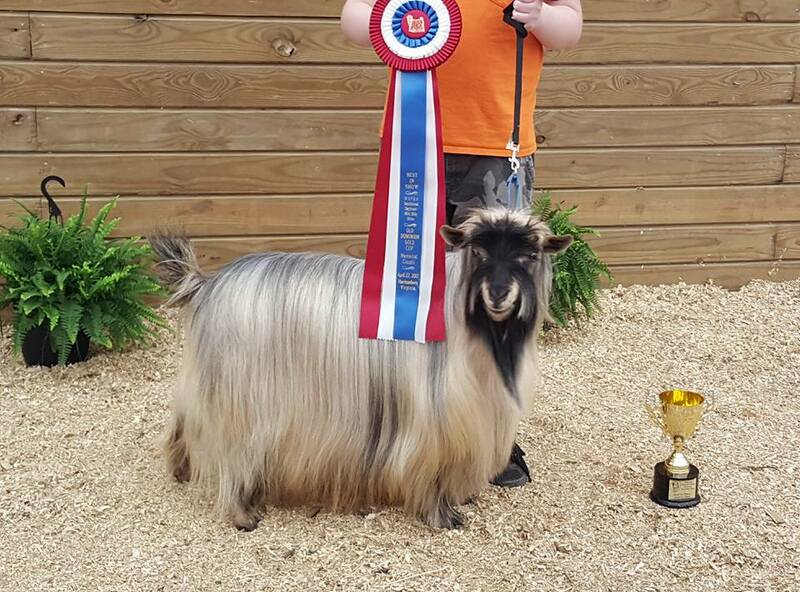 Bodhi earned his 4th Grand Champion leg at the ODGC Mini Silky Shows in April 2014. He also won Best In Show at the ODGC Sunrise Show! Bee Bop Kid was 2010's Top Winning Mini Silky of the Year! Bee Bop is a super gentle and sweet, extreme coated buck. He has done amazing at the last couple of shows here in Virginia, obtaining his MCH at the 2010 ODGC Stephen K. Orr Memorial shows. He has 5 Best in Shows and has taken the coveted Best Coat in Show 3 times (he was up against some really strong competition!) 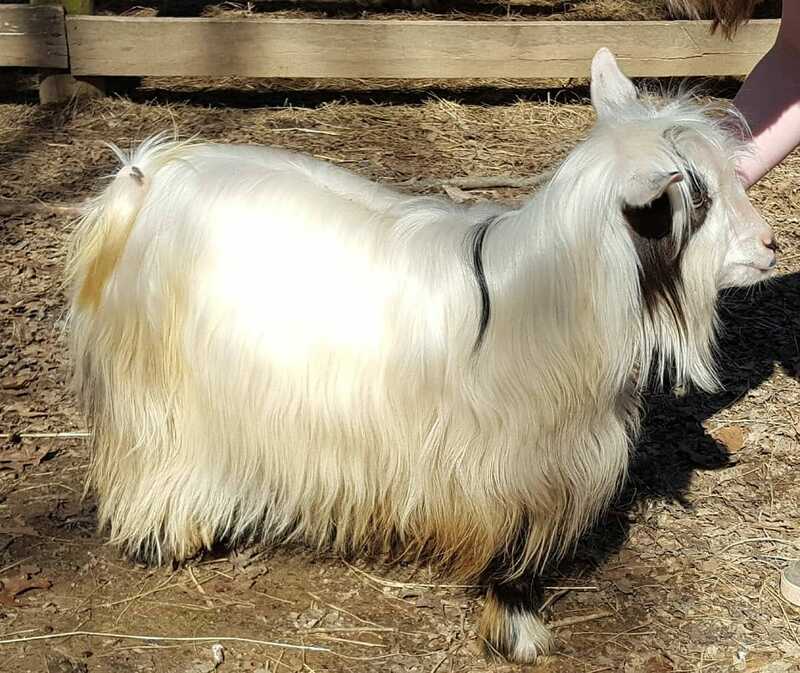 You really have to feel this guy's coat - it is absolutely the softest, silkiest fiber and so lustrous. This is a very exciting addition to the farm. Born 12/30/2017, this promising little buck is out of Mch Flying J Absolute and Mch Springs Run Breezy. I am thrilled with the opportunity to add his pedigree to our breeding program. Bonus, he is sweet and snuggly. Look for him in the show ring! This dude is the coolest! His dam is Bear Creek's Daffodil and his sire is Mch Bear Creek's Bodhi. He is petite like his dam, has the amazing coat of his sire, and has the fun, super affectionate personality that both parents have. My youngest son was attached to him from the start and the two are full on BFF's. We can't wait to see how 'Dude' does in the show ring! MCH Bear Creek's Moonshine, on left at 15 months, photo courtesy Randy Taylor. On right, at 27months. Moonshine is developing an extraordinary long and silky coat. Just a little guy, he is sweet and gentle and absolutely beautiful. This is another buck that has really done well in the show ring. He is a full brother to MCH Sol-Orr's Mirabel and half brother to two other Master Champions. Pictured here at just about 3 years old, Montgomery has marbled blue eyes and has a soft, silky extreme coat. Photos courtesy of Mike Kosciw.